Unavailable. Out of Stock. Expected by May 15th. 16 oz. Fire Suppression Unit for Extinguishing Small Class A and Class B Fires. FireAde 2000 fire fighting agent is biodegradable, environmentally safe and easy to use. Quickly extinguishes fires involving wood, paper, cloth, oil, gasoline, flammable liquids and grease. FireAde 2000 fire suppresant units are ideal for extinguishing small fires in the home, auto, shop and camping. Keeping a FireAde 2000 extinguisher nearby can save lives and property damage. Many fire departments, law enforcement personel and racing safety crews carry FireAde 2000 fire suppression units for quick, first response to small fires and flammable fuel spills, eliminating expensive clean-up and damage to property. Equivalent to a 1A10B Fire Extinguisher. "The Most Advanced Fire Suppressant on the Market"
Meets or exceeds D.O.T 2Q requirements. Contains UL/ULC Listed Foam Concentrate 14CY, UL Tested and Approved as a Wetting Agent in accordance with ANSI/NFPA 18 for physical properties and fire extinguishment 93VO, ULC Listed Air Foam Concentrates, this product is PH Neutral and contains NO Toxic materials listed in SARA 313 or RCRA 40 CFR part 261 and 262. FireAde has been tested by more worldwide government agencies. What is a Class "A", "B", "C", & "D" fire? Class "A" fire is one involving ordinary combustible materials, such as wood, cloth, paper, rubber, as well as many plastics. Class "B" fire is one involving petroleum based products, flammable liquids, greases, gases, and rubber. Class "C" fire is one involving energized electrical equipment. As long as electricity is flowing to and through the electrical appliance. Remember: when the electricity is shut off, the fire becomes a Class "A" Fire and usually goes out unless it had gained enough headway at the time of electricity shut-off that it had transmitted the fire to other substances. Class "D" fire is one involving combustible metals or metals which generate their own oxygen, such as magnesium, titanium, zirconium, sodium, and potassium. Is FireAde 2000 effective on all Classes of fire? No - FireAde 2000 is not effective on Class "C" fires involving electricity owing to the fact that there normally isn't a way to extinguish an electrical fire other than shutting off the electricity. Is the Fire Extinguisher effective on Class "A" fires? Yes - FireAde 2000 extinguishes the fire by rapidly penetrating the object reducing the radiant heat. When applied to a hot or burning object, the object can be cooled to the point that it no longer supports re-ignition. The ability to prevent re-ignition is useful in widely diverse situations, including and not limited too: Wood, Paper, Fabric, Cotton, Plastic and Rubber Products. Is the fire extinguisher effective on Class "B" fires? Yes - FireAde 2000 extinguishes Class "B" fires by rapidly interacting with the Class "B" liquids attacking the Fuel, Heat and Free Radicals; significantly cooling the liquid to the point that re-ignition is no longer a threat. FireAde 2000 will also render flammable liquids non-flammable. Why is FireAde 2000 so effective on Class A and B fires? FireAde 2000 attacks the Heat, Fuel, Oxygen, & Free Radicals of the Fire Tetrahedron. Traditional fire extinguishers only attack the oxygen side of the Fire Tetrahedron. Note: In layman's terms, Free Radicals are the actual unburned gases that release from a fire giving smoke it's black appearance and allowing the fire to grow in temperature. Unlike traditional extinguish agents that only attack the oxygen, FireAde 2000 is able to extinguish the fire faster and more effective because it can to attack all sides of the Fire Tetrahedron. Is there any health risk in using the Fire Extinguisher? No - FireAde 2000 is water base with a pH of 7.3 (water being 7). FireAde 2000 is environmentally friendly, non-toxic and non-hazardous. FireAde 2000 is not powder based and doesn't and has none of the breathing and vision problems associated with dry powder extinguishers. Note: Race car drivers frequently use FireAde 2000 to spray themselves down when getting out of a burning race car. Could I use the fire extinguisher to extinguish burning clothing on someone and will it remove the heat from the clothing? Yes - FireAde 2000 can be used to extinguish burning clothing on a child or adult. It's highly recommended by Racing Car Professionals for the safety teams to immediately spray the drivers with FireAde 2000 if they are on fire! FireAde 2000 immediately extinguishes the burning clothing by penetrating the clothing and simultaneously removing the heat. Note: FireAde 2000 will achieve a temperature reduction from 1000 Degrees F. to less than 90 Degrees within 5 seconds. Could I use the fire extinguisher to spray myself if I was trapped in a fire and had no choice but to run through the fire? Yes - FireAde 2000 fire extinguishers could be used for an emergency situation. FireAde 2000's penetrating and cooling properties will withstand extreme temperatures. FireAde 2000 is now being sold to race car drivers in the first on-board fire system designed to soak the driver down with FireAde 2000 if they are caught in flames. FireAde 2000 has already been credited more than once for helping a driver get to safety from their burning car. Fire Chiefs in various Fire Departments have recognized this added benefit and recommend that FireAde 2000 be used for their own Fire Fighters before entering a building fire. Note: This application of FireAde 2000 should only be used if this is your last resort to escape fire. 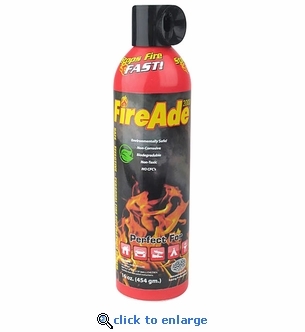 Remember FireAde 2000 will only protect clothing that its sprayed on during escaping the fire. Untreated parts of your clothing will burn. Does the Fire Extinguisher "cool" burning objects? Yes - FireAde 2000 rapidly cools burning objects preventing re-ignition. Current tests showed that FireAde 2000 achieved a temperature reduction from 1200 Degrees F. to less than 90 Degrees F. within 10 seconds. How does FireAde 2000 "cool" the fire so rapidly? FireAde 2000 proprietary formulation is able to cool the fire rapidly by covering more surface area and at the same time penetrating deep down into pores of the material removing the heat. Note:Traditional Dry Powder Chemical fire extinguishers only displace the oxygen feeding the fire and do nothing to remove the heat from the material. They only cover the surface of the material burning. Does the fire extinguisher have any effect on the poisonous and toxic smoke? Yes - FireAde 2000 quickly attacks many poisonous and potentially fatal toxins that are frequently present in dense smoke upon contact with fire. Visibility is significantly increased. How does FireAde 2000 turn black smoke into a white smoke? FireAde 2000 proprietary formulation is so advanced that the agent will capture (encapsulate) dense and toxic black smoke rapidly changing the black appearance to white smoke as the product is applied. FireAde 2000 interrupts the free radical chain reaction thus preventing them from forming soot and smoke. A cool steam is generated after the fire is extinguished. Note: Traditional fire fighting foams and Dry Powder Chemical Agents do not have any effect on encapsulating the dense toxic black smoke. If I have spilled fuel in my garage, can I spray the fire extinguisher onto the spill to prevent ignition? Yes - by applying the FireAde 2000 fire extinguisher to the spill, flammable liquids, such as gasoline, will be rendered permanently non-flammable. However, if it's a large fuel spill, the 16 oz. FireAde 2000 fire extinguisher will not be enough to treat the entire spill. The fire extinguisher is excellent for small flammable liquid spills. Note: In an emergency situation, even a small FireAde 2000 fire extinguisher will aid in reducing the amount of flames! Can FireAde 2000 be applied directly to my engine compartment without damaging my engine? Yes - FireAde 2000 can be applied directly to your engine compartment without damaging the engine. In all of our live presentations we actually show a running engine with FireAde 2000 fire extinguishers being sprayed directly onto it. Race car drivers and safety crew chiefs find FireAde 2000 to be very valuable because of this benefit alone. Can a FireAde Extinguisher extinguish pyrotechnic road flares? Yes - FireAde 2000 fire extinguishers will extinguish pyrotechnic flares. Road flares and rescue pyrotechnics, used by Police Officers, Marine Industry, D.O.T. and other agencies, are extremely difficult to extinguish. Current tests show that these flares burn well over 980 Degrees F. and within 2 seconds after FireAde 2000 has extinguished the flare, the temperature will be measured below 90 Degrees F. This is remarkable since most flares are so hot and supply their own oxygen, they will continue to burn under water. Will the extinguisher work on a grease fire? Yes - FireAde 2000 kitchen and domestic extinguishers are specially designed for grease fires. However, with any type of fire extinguisher, extreme caution should be taken when fighting grease fires if the delivery system is under pressure. There is a risk that the pressure will blow hot burning grease around. Pointing the nozzle directly into the burning grease is not the correct application. Stand away at a safe distance (approx. six to eight feet) and sweep the fire extinguisher side to side extinguishing the flames. FireAde 2000 extinguishers will rapidly cool the burning grease bringing it below re-ignition temperatures. Is the fire extinguisher easy to clean up after use? Yes - FireAde 2000 is very simple to clean up. In fact FireAde 2000 enhances the clean up process after the fire. FireAde 2000 breaks up sooty, greasy and oily residue leaving a clean surface after use. No scrubbing or other special cleaning efforts are required to remove FireAde 2000. Caution: Under certain fire and heat conditions, the Dry Powder Chemicals will cause damage or prove extremely difficult to remove from oven surfaces, including self-cleaning models. Improper use of Dry Powder Chemicals could cause serious bodily injury or property damage. Note: The next time you see a Dry Powder Chemical extinguisher in the store, look at the picture of it being sprayed in the kitchen. The spray pattern is not real. Its computer generated! The manufactures of Dry Powder Chemical extinguishers obviously know the damage and mess that it will cause. Do the fire extinguishers require maintenance? Very Little - FireAde 2000 Fire Extinguishers periodically need to be examined for damage or broken tear tab. Is the fire extinguisher effective on Class "C" (Electrical) fires? No - FireAde 2000 will not extinguish electrical fires. To extinguish Class "C" fires you first have to turn off the electricity. Once the electricity has been turned off, in most cases you will then be fighting a Class "A" fire and FireAde 2000 is highly effective for Class "A" fires. Note: FireAde 2000 16 fire extinguishers are water based. However, our fire extinguishers are charged with de-ionized water and will not conduct electricity. We hope these FAQ's have been helpful. Please contact us if you have any other questions or concerns. Free ground shipping to the 48 contiguous states. Shipping Restrictions: FireAde 2000 extinguishers can only ship via ground to US addresses in the lower 48 states. Cannot ship to AK, HI, FPO/APO/DPO addresses or internationally.